We believe that working together we can do more than working alone. 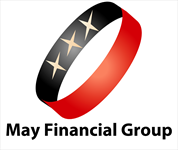 Together we can protect investments from economic turbulence, and build future income: Terry May, Wayne Fourman, Doug Shields and Trent May of the May Financial Group, Inc. serving Greenville and Dayton, Ohio area since 1983. ● We will build your personal investment portfolio based on your risk tolerance and personally available investment choices. We determine an individual quarterly asset allocation with instructions for you to enter through your online account or instructions to give your account provider. ● We will build your personal investment portfolio based on your risk tolerance and available investment choices. We will then continue to monitor it making sure it's appropriately allocated.